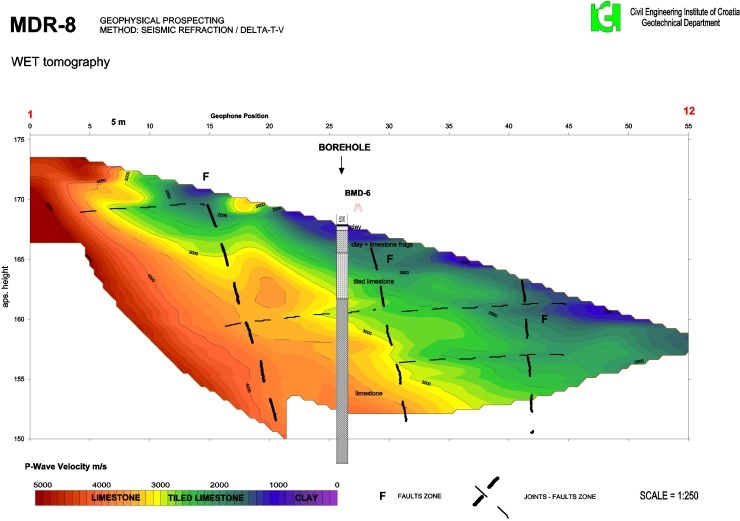 Our Rayfract® refraction tomography software allows reliable imaging of subsurface velocity structure including faults, strong lateral velocity variation and other velocity anomalies. Our Smooth inversion tomographic method is based on physically realistic modeling of first break propagation for P-wave and S-wave surveys. We forward model refraction, transmission and diffraction (Lecomte, 2000) and back-project traveltime residuals along wave paths also known as Fresnel volumes (Watanabe, 1999) instead of conventional rays. This increases the numerical robustness of the inversion. A smooth minimum-structure and artefact-free 1D starting model is determined automatically directly from the seismic traveltime data by horizontally averaging DeltatV (Wiechert-Herglotz) method 1D velocity-depth profiles along the seismic line. The starting model is then refined with 2D WET Wavepath Eikonal Traveltime inversion (Schuster, 1993). No need to map traveltimes to refractors. Plot 1.5D refractors obtained with layer-based Plus-Minus and Wavefront refraction methods on 2D WET tomograms. Map traveltimes to refractors interactively or semi-automatically. Automatically convert refractors to layered starting model. Smooth inversion of borehole surveys with constant-velocity starting model for crosshole, zero-offset VSP, walkaway VSP, reverse VSP and VSP constrained refraction surveys. Bidirectional frequency filtering of traces with single-pole or Chebyshev-Butterworth filter. Check your picks for reciprocal traveltime errors in Trace|Offset gather display. Shift picks for all traces of same shot with trigger delay correction. Review our SAGEEP 2010 manual (PowerPoint version, function key help). Import SEGY and SEG-2 seismic data files and 3rd-party ASCII files using .HDR batch import of shots. Our XTV inversion models critical refraction of first breaks (intercept-time method) besides diving waves (with DeltatV method) and allows better modeling of low-velocity weathering overburden without a gradient, now both for 1D starting model and for pseudo-2D imaging. Use Gaussian smoothing as an alternative to uniform smoothing during WET inversion for better resolution. We now support the Conjugate Gradient method for improved imaging of sharp velocity contrasts besides our default Steepest Descent method. Use your layered refraction starting model for WET inversion. Our latest version 3.36 allows multiscale tomography with our new multirun WET inversion. Weight WET velocity update across wavepath with Cosine-Squared function instead of Gaussian function for better imaging of vertical fault zones . Version 3.36 can process first breaks recorded with a circular receiver spread planted on tunnel wall. 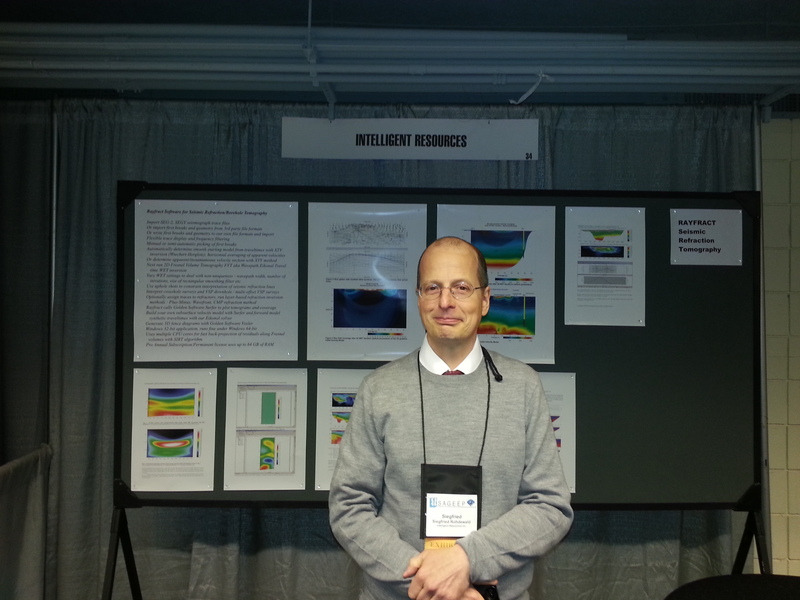 Our booth at SAGEEP 2014 in Boston MA, U.S.A. Smooth inversion with free trial, of Palmer Mt. Bulga data. Shows interactive varying of WET wavepath width, to control non-uniqueness. Integrating Hydrogeological and Geophysical Methods for the Characterization of a Deltaic Aquifer System, Falgas et al. 2011.